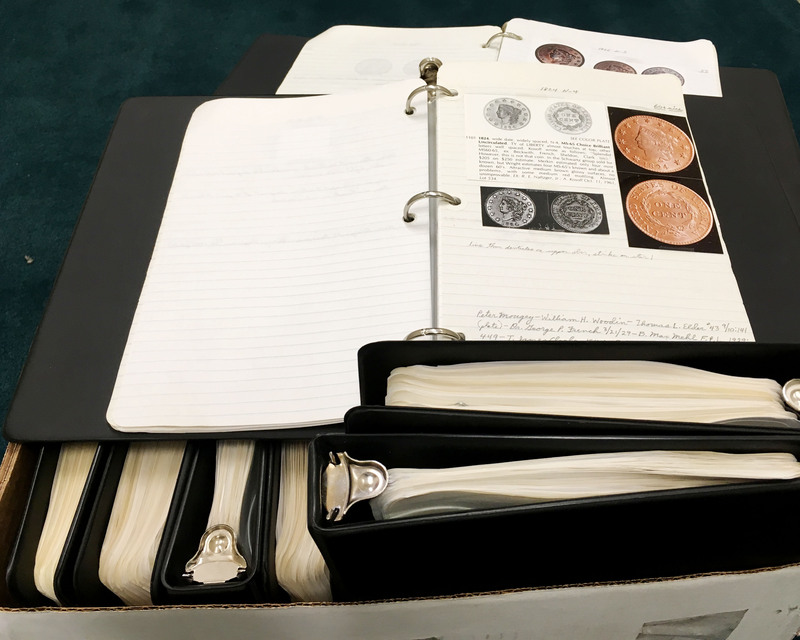 The American Numismatic Society is pleased to announce the acquisition of the vast archive of research data assembled by United States large cent expert Del Bland, who died in late 2018. Nearly 50 years ago, Bland began scouring auction catalogs, meticulously compiling information on the condition, sale prices, and ownership of large cents. By the end of his life, his efforts had produced an enormous unpublished reference work, consisting of almost 300 large ring binders weighing some 900 pounds and occupying 40 feet of shelf space. We are deeply indebted to the ANS members whose contributions made possible the purchase of these materials, particularly long-time benefactor and numismatic author John Adams. The other donors are Robert Rodriguez, Dan Hamelberg, William Burd, and Joel Orosz, as well as David Fanning, of the numismatic auction firm Kolbe & Fanning, who also worked closely with Del and the Bland family to arrange the acquisition. We thank them all for their contributions to the ANS and to the research community generally. The ANS eagerly anticipates making this material available to researchers. However, given the nature of some of the information contained in the archive, including the names of some current large cent owners, the Society’s Board of Trustees has decided to delay making the materials available for study so that current owners might have a chance to request that personally identifying information be redacted before the materials are made available. Anyone with such concerns can contact ANS librarian and archivist David Hill at hill@numismatics.org, providing him with references to specific coins. With the exception of sections redacted by request, all of the materials will be made available to members (and to general researchers paying the standard library use fee) on April 1, 2019. Additionally, the board has decided that the materials may not be reproduced in any way. Users, for example, will not be permitted to use hand-held devices to capture images, and scans of the materials will not be placed online.